The interview was made only with Nir, as Alon was called to reserve army service. Alon did answer few questions on the phone, though. It was quite fun to see the studio together in a same room with a bed and cloths thrown on the floor. What else was nice, was that the PsyCraft studio is 5 minutes walk from my home! Alon Algrasi & Nir Sadon. We both learned to play keyboards and guitar. What brought you into trance music? Nir: An uncle of Guy Doron, who was part of the group in the beginning (when it was called Cybel) introduced trance to Alon, Alon introduced it to me, and that was it. Nir: When Alon got me to listen to trance, we started to think how can we make this ourselves. After consulting a friend, he brought us a 16bit soundcard, we got a B&W Cubase and started to play with it, till I went overseas and came back with a Morpheus module, that we still have in our studio today. Do you use mainly Midi equipment or Audio (software)- or do you combine? Nir: We combine Midi and Audio, but the aim is to move to Audio alone. 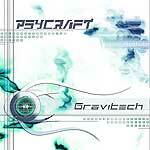 Tell us about your new album- Gravitech- style, production, etc. Nir: The album was made over a year and a half of work, so it has different styles of music, and we think that any electronic music lover will find the track he loves in it. Usually we work on a track for a month until we feel it's really ready. How about the guitars in your tracks? They sound more melodic than with other trance artists. Nir: We see our music as music for listening and not for parties only. So our guitars our more melodic and played by Alon. There are quite a lot of samples through the album- where do they come from? Movies or recorded especially? Nir: Most of the samples we take from DVD movies, except from the sampled speech in Hypnotic M-S-G, which my uncle got from Simon Posford. 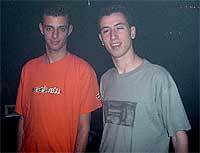 You've been making trance music for a long time now, why did it take so long for your debut album to get released? Nir: We like to work slowly and take our time with the tracks. Every track we made in the past went straight to compilations. Then we finally decided that we want to make an album, and started collecting the tracks for it. Nir: First of all we hope that the album will sell, and reach as many people as possible, and that the name PsyCraft will be known around the world, and also that we can see some money out of it. Alon: We want to be recognized around the world, so we can go tour around. Alon: Guitarist Steve Vai, rock band like Metallica, and from trance artists like Ticon, Dado & Simon Posford. What happened to Cybel? Do you intend to go back to work under that name? Nir: We had a problem with Cybel- Guy & Alon didn't get along musically, each going for a different direction, so we decided to break it up. Everyone started to work on his own, till I got a phone from Alone offering me to do a track together- since then we're together as PsyCraft. Do you have any other side projects or planning on ones in the future? Nir: Meanwhile there are no side projects, but we hope to develop into different musical directions, making more electronic music projects, not necessarily trance. Where do you think the trance scene in the world is heading for? What is your part in it? Alon: The scene is breaking around the world slowly. We do our thing by making a certain style of music that we like- more people listen to it and get in trance. Are there any artists that you would like to work with? Nir: We would love to work with Simon Posford, Infected Mushroom or Space Cat, because we think we can learn a lot from them. Do you DJ or play live? What was your best party? Nir: Both, also we do weddings, Bar-Mitzvahs & birthday parties :-) Our best party was Oma-Coma's party in the Zoom club in Tel-Aviv few months ago. We played live with guitar and it was great, there were a lot of people, a great crowd. Do you work in another job? Is the money from the music enough for living? Nir: We're not doing this for making money, but for the love of music. I do hope that with the new album our financial situation will get better. Alon is a software student and I work in computer communication. Nir: Do what you love, and not what labels tell you. It's very important that you are the ones satisfied with your tracks, and not someone else. Nir: We wanna thank our families for putting up with the noise, to Carmit and to Cobweb. Alon: And also to Yuli (BLT), Michael Reznik (Morax) and Eyal and the HOMmega family.